The originator of the Crimson Dawn was Tom Stodghill from Terrell,TX . This color pattern is technically known as Black Winged Bronze and is the result of the action of a recessive genetic factor on the bronze pattern which is a recessive allele to both black and bronze patterns -- B (black), b+ (normal wild bronze and b1 (black winged bronze). The "b1" allele is also what gives Royal Palm,Calico and Sweetgrass birds their solid slatey-black wings. 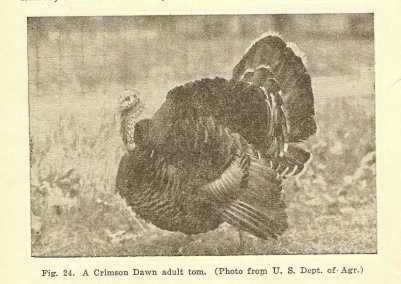 The Crimson Dawn Primaries are solid black, Lower secondaries are black overlaid with crimson-gold bronzing.Upper secondaries are black finely stippled with buff , tips pure white forming a line across the wing. The main tail is tan, irregularly penciled with black, tip possessing a band of rich crimson-gold bronzing ,bordered front and rear by a narrow black band and terminated by a broad band of pure white. The hens tend to be a bit lighter colored than the tom because of more distinct white lacing on the tips of their body feathers. The major visual effect is the predominance of a rose pink cast to the iridescence of the feathers in the sunlight, That's why the originator "Tom Stodghill" dubbed them "Crimson Dawns." 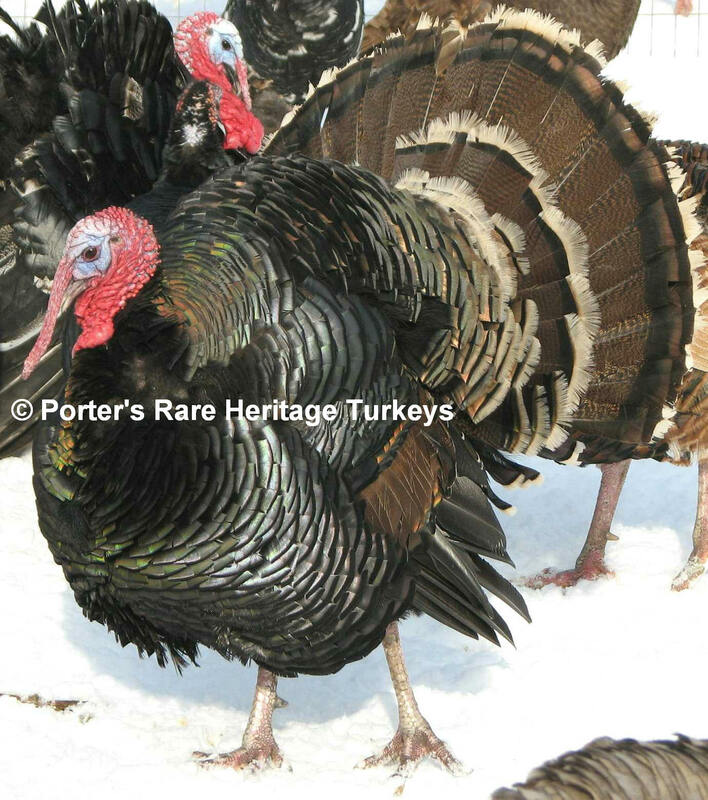 His preferred weights for old birds were toms at 36 lbs and hens 20 lbs. 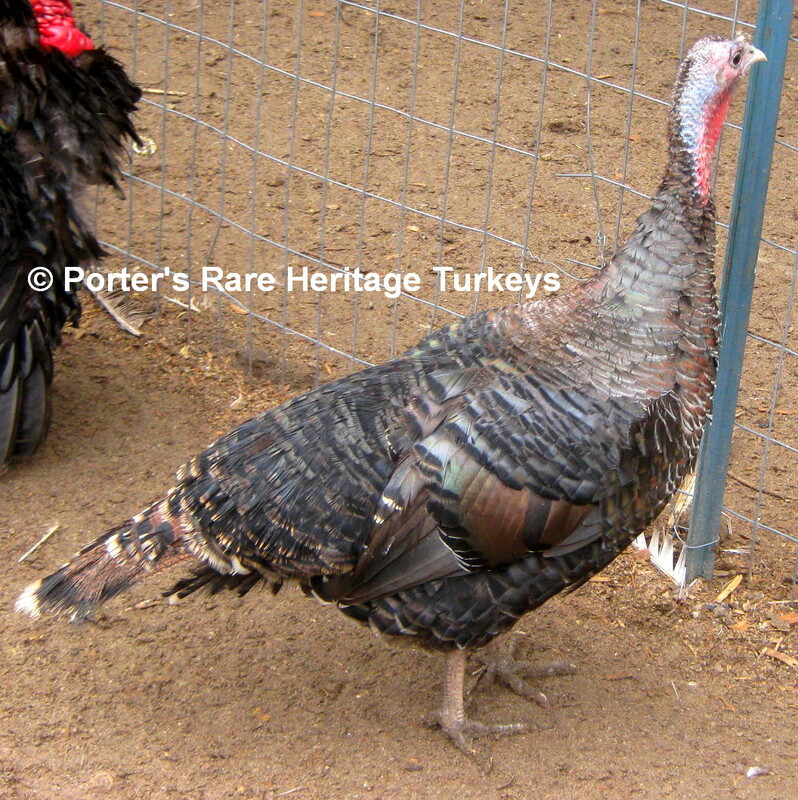 The poult pattern is similiar to the bronze except that the ground color is yellowish white instead of light brown, producing the appearance of a pale-colored bronze poult. Or simply (b'b') This is the pure true breeding type. The pure BWB will basically look like a normal bronze with mostly solid black wing feathers. Note the irregular penciling in the tail feathers and also the buff stippling in the secondary.